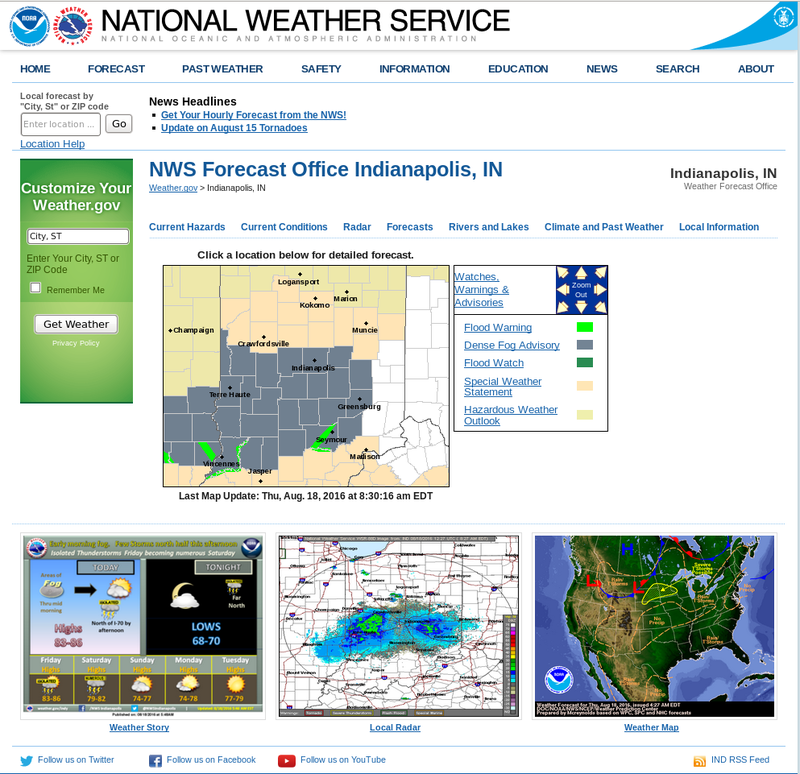 Dense Fog developed over southern Indiana on the morning of August 18 (and advisories were hoisted). The single image above demonstrates an advantage of GOES-R IFR Probability fields in determining the areal extent of fog: the traditional method of night-time fog detection from satellite fails in regions where cirrus clouds obscure the view of low clouds. That was the case over the Ohio River Valley where IFR conditions were occurring. GOES-R IFR Probability fields have a signal where high clouds exist in regions where Rapid Refresh model output shows low-level saturation, as over southwestern Indiana. Because satellite data cannot be used there to compute IFR Probabilities, the magnitude of the probability is smaller. Tailor your interpretation of the IFR Values based on the presence of high clouds. The presence of high clouds changes the character of the IFR Probability field, from a pixelated field where satellite data are present to a flatter field where only model data can be used. GOES-R Cloud Thickness can be used to estimate fog dissipation time (using this scatterplot, where the thickness values are from the last pre-sunrise scene). That field, however, is only produced where the satellite has an unimpeded view of the low clouds (therefore, where cirrus clouds are present, as over the Ohio River Valley, Cloud Thickness is not produced). Note the line parallel to the terminator over eastern Ohio: GOES-R Cloud Thickness is not produced during twilight times around sunrise or sunset. This 1045 UTC image is the final one over Indiana before sunrise. Maximum thickness values are just over 1000 feet over southwest Indiana, suggesting a dissipation time of about three hours, that is, around 1345 UTC. 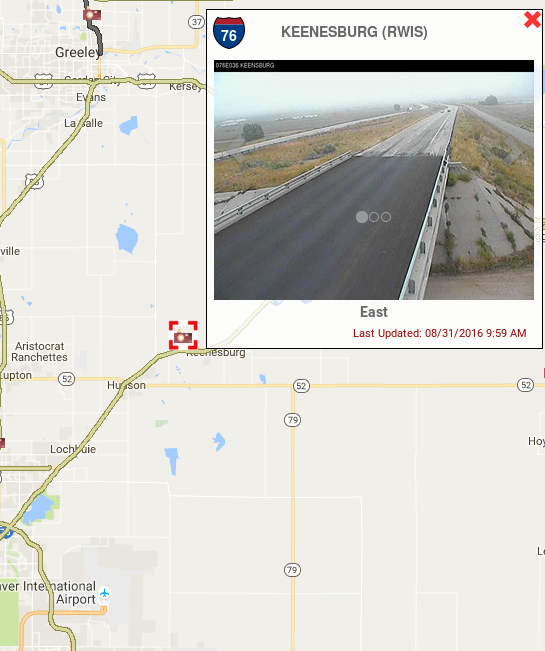 This entry was posted in Midwest on August 18, 2016 by Scott Lindstrom. 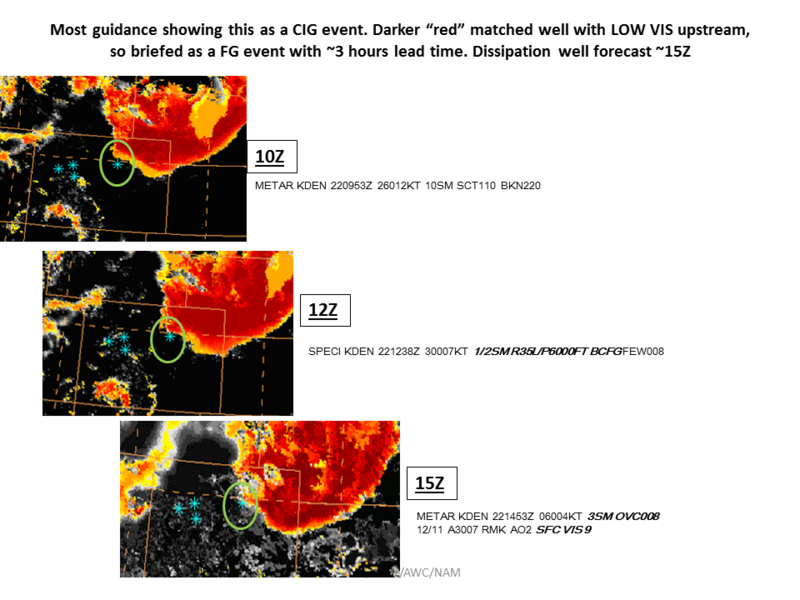 When GOES-R IFR Probability fields are governed solely by Rapid Refresh model output because of thick cloudiness (as was the case over Illinois on 15 August 2016), there can be changes in the field at the top of the hour that are related to changes in the Rapid Refresh model output — that is, changes in which hour Rapid Refresh Model is used. 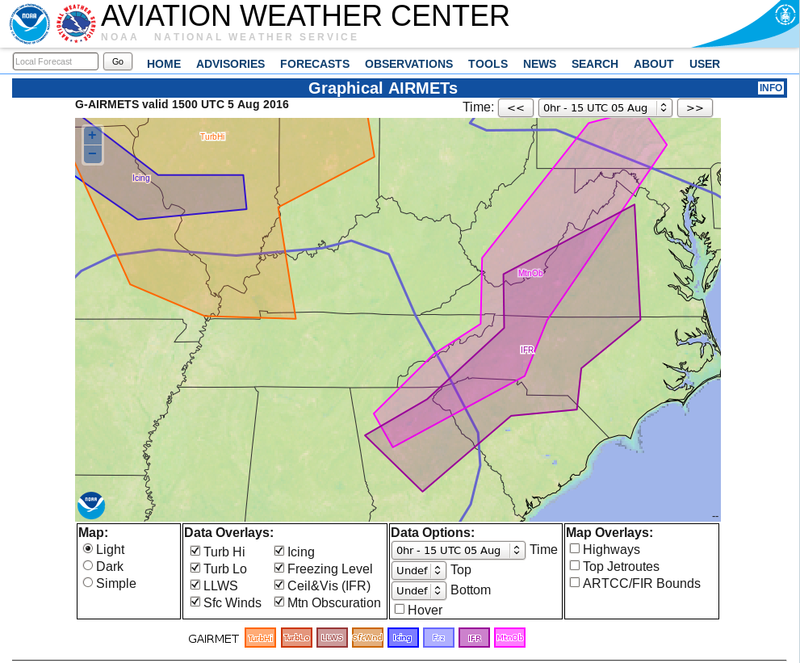 The toggle above shows the IFR Probability fields at 1045 UTC and 1100 UTC on 15 August. Both fields are characterized by smooth values that come with IFR Probability that is driven by Rapid Refresh model output, output that is smooth and not pixelated like satellite data. It’s pretty noticeable, however, that values increase (from ~39% to ~52%) in those 15 minutes. Why? The image below shows Rapid Refresh Model Predictions of 1000-700 mb Relative Humidity at 1100 UTC from the 0800 UTC model run (that is, a 3-hour forecast, left) and from the 0900 UTC model run (that is, a 2-hour forecast, right). 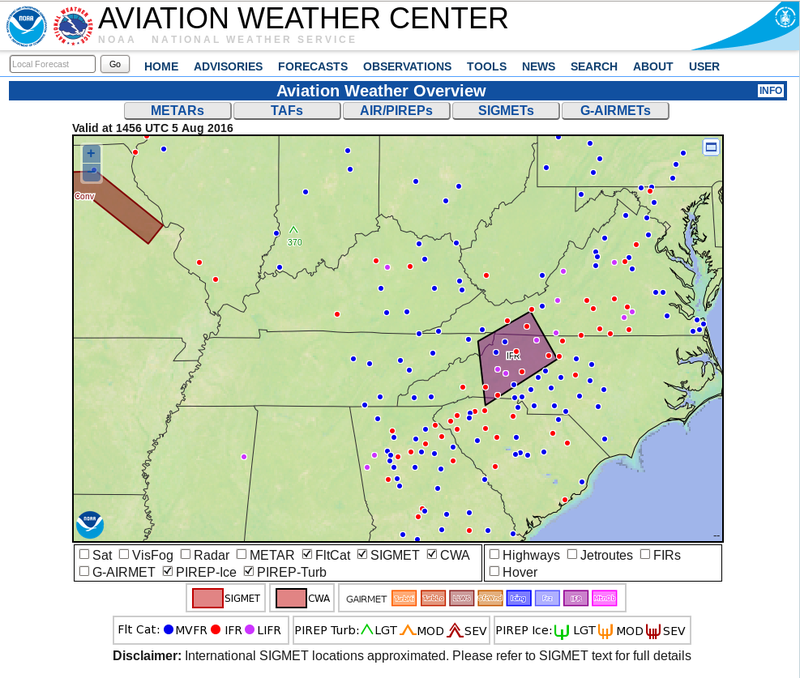 Relative Humidity Values from the 0800 UTC Run (interpolated to 1045) are used in the computation of IFR Probabilities at 1045 UTC; values from the 0900 UTC Run are used in the computation of IFR Probabilities at 1100 UTC. It’s not this relative humidity field (value from 1000-700 hPa) precisely that is used, but rather maximum values in the vertical. Certainly there are changes in the predicted low-level relative humidity field at 1100 UTC between the sequential model runs; it’s more likely that saturation is occurring in the later model run, and that greater likelihood of saturation is reflected in the change of IFR Probability from 1045 UTC (when 0800 UTC Rapid Refresh Model fields are used) to 1100 UTC (when 0900 UTC Rapid Refresh Model fields are used). 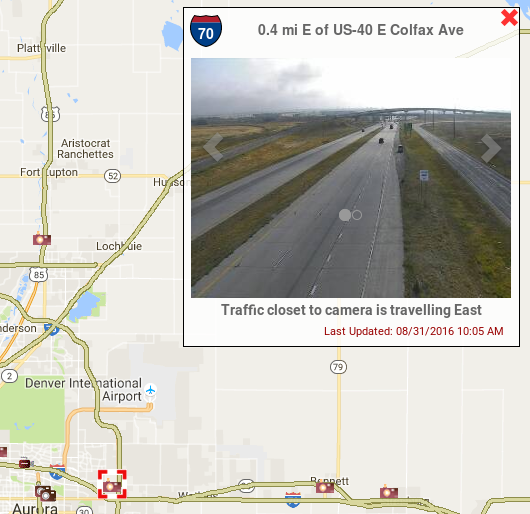 This entry was posted in Midwest on August 16, 2016 by Scott Lindstrom. 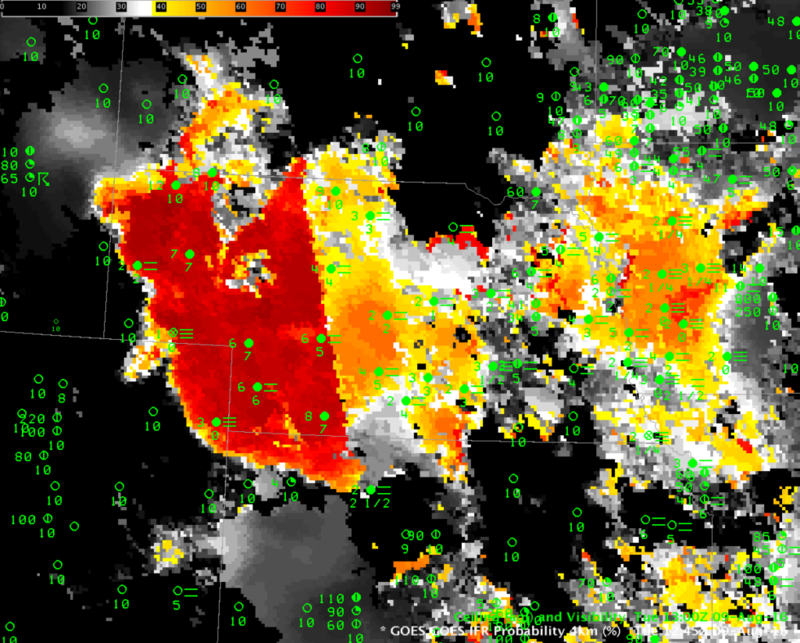 GOES-R IFR Probabilities show the development of IFR-producing stratus and fog over central and western Nebraska between midnight and dawn on 9 August 2016. The character of the field suggests that satellite data and Rapid Refresh Model output are both contributing to IFR Probability fields; IFR Probability fields will look far flatter in appearance (just one color) when model fields only are used. GOES-R Cloud Thickness can be used to estimate when fog/low stratus will dissipate (using this scatterplot). 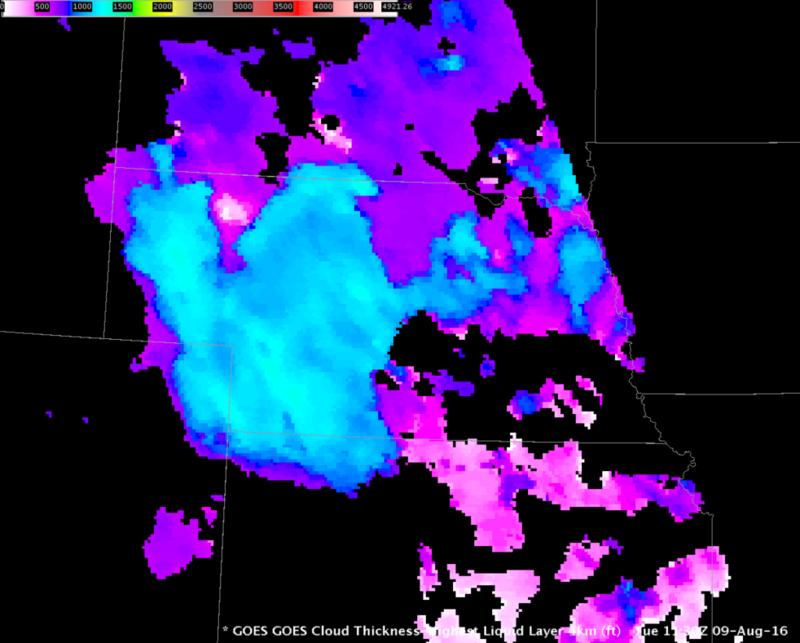 The image below shows the last Cloud Thickness before twilight conditions (during twilight conditions, GOES-R Cloud Thickness is not computed — over Nebraska at this time of year, that’s generally about 2 hours starting around 1145 UTC). The largest values are around 1280 feet, which corresponds to a dissipation time of more than four hours, meaning the fog/low clouds should persist to at least 1530 UTC! 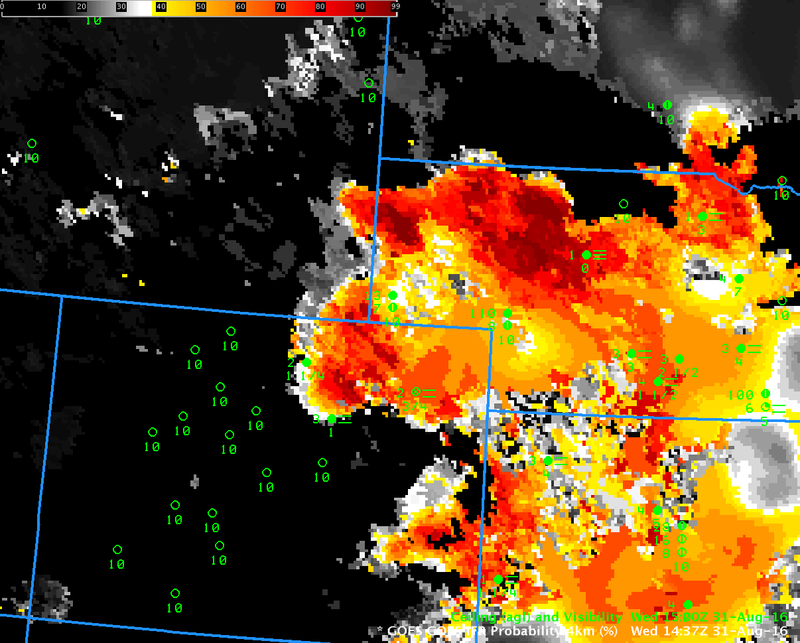 GOES-14 was observing Nebraska at 1-minute intervals on 9 August, as part of GOES-14’s SRSO-R. The animation from dawn (~1204) through 1610 UTC is below. Fog Dissipation is mostly complete by 1600 UTC. This entry was posted in Plains on August 9, 2016 by Scott Lindstrom.